​ Our mates the Roadrebelz spent 2 months travelling extensively across our bus network. ​ Years ago, I used to pack SO MUCH stuff with me on trips, and it always felt overwhelming. Most of the extra things I'd bring with me were left untouched, and I'd always end up just wearing my usual comfy clothes anyway! I knew I had to make a change. ​ Our guide to riding the green bus and blue slabs across New Zealand! ​ New Zealand. A small country with a big heart. Drastic in beauty and humble in charm, it regularly makes a mockery of Instagram filters. ​ When asked about what food New Zealand is famous for, it is hard to pick just one thing. We are a diverse country in many ways and we love our food! ​ If you’re in New Zealand when the clock strikes midnight on the 31st of December you will be one of the first people in the world to celebrate the start of 2019. ​ Travelling with Kiwi Experience between now and Mid-January? Check out these helpful hints! ​ New Zealand is a small country, however it has great diversity amongst people, landscapes and activities. During your Kiwi Experience we will ensure that you tick all the most popular “places to go” off your list, but we also make sure you have the chance to stay in unique places that no amount of Googling will find. ​ AUCKLAND IS CONSISTENTLY FEATURED ON TOP 10 LISTS OF PLACES TO VISIT & LIVE. ​ So you're trying to decide if it's worth leaving the Northern Hemisphere's tropical (or not so) mid-year months to head to New Zealand mid-winter? As the cold descends upon the southern hemisphere like a chilly mist floating down onto a valley, it actually provides the perfect opportunity to visit New Zealand. ​ The jewel in the crown that is the South Island. ​ We are not afraid to say: traveling is one of the gretest things you can do in your life. It sounds cheesy, but travel is the only thing you can buy that makes you richer. So… Going on an adventure opens your eyes, puts you in contact with a new culture and takes you to visit all the incredible corners of this beautiful world. Travel can however do a number on Mother Earth and if we don’t adopt an eco-friendly mindset, many of the world’s beautiful attractions will be spoilt. ​ Whether you’re a backpacker on holiday or a snow seeker, this guide will help you to make the most of the New Zealand ski season - one of the best ski destinations in the world. ​ Kaikoura, where mountains drop down to aquamarine waters and whales dwell in the deep blue depths. ​ Chilling in the bottom right hand corner of a traditional world map, New Zealand is situated as far from most other countries as you can get and that can make it harder for budget travellers (hi, nice to meet you!) to take the first step towards their dream holiday: finding a low-cost flight. ​ Travelling with Kiwi Experience allows you to explore New Zealand and experience unique moments which can see you grow and evolve in ways you never could have imagined. ​ When travelling with Kiwi Experience there are experiences to suit all budgets and appetites for adventure and there are heaps of free activities to do along the way. ​ All around the world on March 17th people jump on board the Green bandwagon and celebrate the best of Ireland. New Zealand has rich Irish connections, in fact, three of our prime ministers were born in Ireland. There is a large number of Irish people who call New Zealand home, making it easy to find a local Irish pub (always a good time and a pint of the black stuff is never too far away). ​ Kiwi Experiences cares about the environment. Here are 5 ways we're helping keep New Zealand beautiful. ​ Autumn is the best time to explore New Zealand's incredible landscapes as they burst to life with red and gold shades. ​ Looking for something extra special to impress your loved one this Valentine’s Day? Take a look at our most loved destinations and be inspired to try something new. ​ New Zealand is a quirky little nation and we are very proud of our slightly weird and wonderful ways. ​ Get ready to go underground, swap the skyline for inky cave depths and illuminated crags. ​ Māori have been in New Zealand since approximately 1350 AD, based on tracing the navigational steps of their ancestor, Kupe, from his homeland of Hawaiiki. ​ New Zealand has a large camping culture, and it is easy to see why. Our beautiful landscapes and friendly wildlife make for some of the best backdrops for getting closer to nature. We know camping isn’t for everyone though, so we’ve come up with a way to bring glamour to camping, and hence glamping was born. ​ Coming from your all American kind of hunting family, being outdoors was always engrained in me. ​ KIWI EXPERIENCE TAKES HOME A DOUBLE WIN AT THE GOLDEN BACKPACKER AWARDS! IS IT SAFE TO TRAVEL NEW ZEALAND? ​ We here at Kiwi Experience have been aware of a huge waste problem regarding plastic bags, disposable cups, and plastic water bottles. ​ Walk this way friends. From booking to budgeting here’s the low-down on a few of our most commonly asked questions. KIWI EXPERIENCE SCORES QUALMARK GOLD! ​ Kiwi Experience is stoked to be awarded its first Gold Award for the Qualmark Sustainable Tourism Business Evaluation! ​ As the days get longer, those golden rays beam down and flower buds turn to full blooms; there’s no mistaking that spring has arrived. Before the summer rush and after the short winter days comes one of the best times of the year to travel New Zealand. Here are the best things about backpacking New Zealand in spring. ​ We're excited to introduce you to Dave Anderson who will be landing in Auckland from the U.S. of A. on September 3 to jump on board a Big Green Bus and have the ultimate Kiwi Experience! ​ Lake Tekapo offers the perfect chance to switch off and recharge your batteries without needing to root around in your bag for that elusive adaptor! ​ You’ve packed up your life, and you’re on the backpacking adventure of a lifetime. You’ve headed away on a jet plane, and you don’t know when you’ll be back again. ​ Always dreamed of strolling along in Bilbo’s footsteps, popping into quaint Hobbit Holes and sipping a malty ale at the Green Dragon pub? ​ SO, YOU’VE BOOKED YOUR ADVENTURE IN NEW ZEALAND AND NOW YOU'RE WONDERING WHAT TO BUDGET FOR AND HOW MUCH SPENDING MONEY YOU MIGHT NEED? ​ Kiwi Experience is proud to have won the 2016 Mega Efficiency Impact Award at the NZI Sustainable Business Network Awards. ​ In search of the ultimate adventure playground? ​ Rising from cities, small towns and country paddocks filled with farmers’ stock, no part of New Zealand’s landscape is quite complete without a set of rugby goal posts. ​ When winter hits and you’re after a slick ski resort with guaranteed snow cover, race up the hill to Coronet Peak. ​ Not too far from Queenstown you’ll find "The Remarks” as they’re otherwise known, the stunning jagged edge mountain range looming behind Lake Wakatipu. ​ Rearing to go for the winter season and wanting the down-low on what pow or pistes for your Queenstown and Wanaka ski holiday? ​ EPIC LANDSCAPES, DRAMATIC SKIES, AND PHOTOGENIC TRAVEL BUDDIES. ​ KIWI EXPERIENCE DRIVER'S ARE GREEN, NOT MEAN! ​ The first in our series of hotspots around Aotearoa. We’ll give you a quick snapshot of what’s cool, quirky and backpacker-budget friendly in our favourite towns. ​ Take a break from pasta & tomato sauce; here’s our top picks for cheap eats around New Zealand. The backpacker budget doesn’t usually stretch so far on the dining out front, but if you're savvy you can get some top meals without breaking the bank. ​ BOOKED YOUR KIWI EXPERIENCE BUS PASS IN NEW ZEALAND AND NOW YOU'RE WONDERING WHO YOU MIGHT BE TRAVELING WITH AND IF YOU WILL MAKE SOME NEW FRIENDS? HOW DO THE ACTIVITIES WORK WITH KIWI EXPERIENCE? 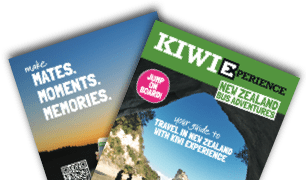 ​ BOOKED YOUR KIWI EXPERIENCE BUS PASS IN NEW ZEALAND AND WONDERING WHAT ACTIVITIES MIGHT BE AVAILABLE ON YOU KIWI EXPERIENCE AND HOW IT ALL WORKS? ​ Nothing symbolises this quite like the Pohutukawa, our iconic New Zealand Christmas tree. ​ IN 10 DAYS OR LESS! ​ When backpacking around New Zealand on a working holiday visa, you will have the opportunity to work and travel at the same time. Some work a lot, some work very little. Either way, the type of jobs available for working holidaymakers is incredibly wide. ​ WHAT DOES IT ACTUALLY MEAN? ​ ​Put misty mountains, volcanic craters, glacial rainforests and a healthy dose of Lord of the Rings in a blender, and you’d finish up with New Zealand’s South Island. ​ TAKING A GAP YEAR AFTER COLLEGE?